I wanted some kind of head covering that would keep my noggin warm, but not muck up my hair. I don't really "do" my hair but I do get hat head and I'd like to avoid that. So I saw some hoodie/scarf combos at walmart but didn't really want to buy one when I thought I could make one. It would have been cheaper to buy one. I decided to buy a pattern but it turns out the pattern is like the free tutorials you can find online. So at least I supported a small business, right? The fabric is some minky-ish fleece and some plaid flannel from Joann's. It's been a long time since I've sewn with knits but it all came right back (mostly). 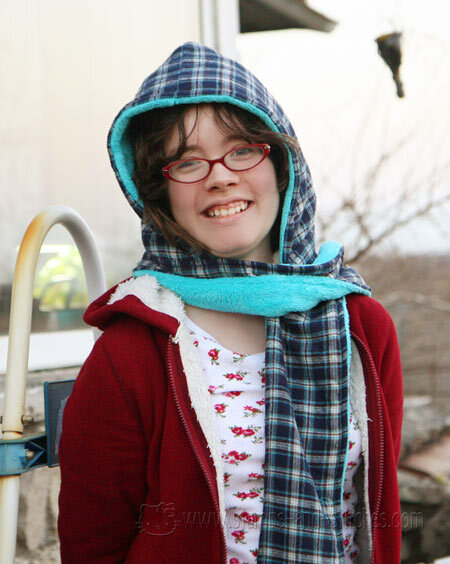 The hoodie scarf is reversible and very cozy and warm. Here is my daughter modeling it. I bought the pattern from jamiechristina.com but if you google "hoodie scarf tutorial" you'll probably find a pretty close match. And free. gale, this is so adorable. i just love it and your daughter is beautiful! ooooo she's a great model!!! Love the scarf - so glad I don't need one. LOL! Gale, I can already tell you that this just HAS to be cuter than anything you could have bought! Love the plaid you used and it's as cute as can be! I don't think I'd need it this far down in Texas though! We're suppose to be back up to 80 degrees today!!! Oh, and by the way.......VERY pretty daughter and she looks like an up and coming model! I love your hoodie/scarf, great that it is reversible. Gale, this hoodie/scarf is fantastic! Love it! And your daughter looks adorable wearing it! Very cute. I love hoodie scarves. Your daughter is adorable and that cute scarf looks so warm. Very pretty and just perfect for this time of year! What a beautiful daughter you have and that scarf is super cute.